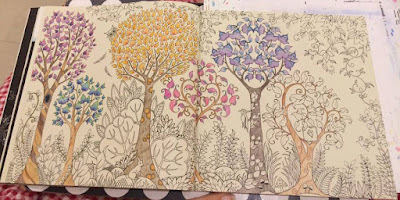 This time in Step-by-Step Lizzie is sharing with us her colouring of this popular double page spread from Enchanted Forest. This series follows just normal colourers like me, to show you the process of their colouring decisions. 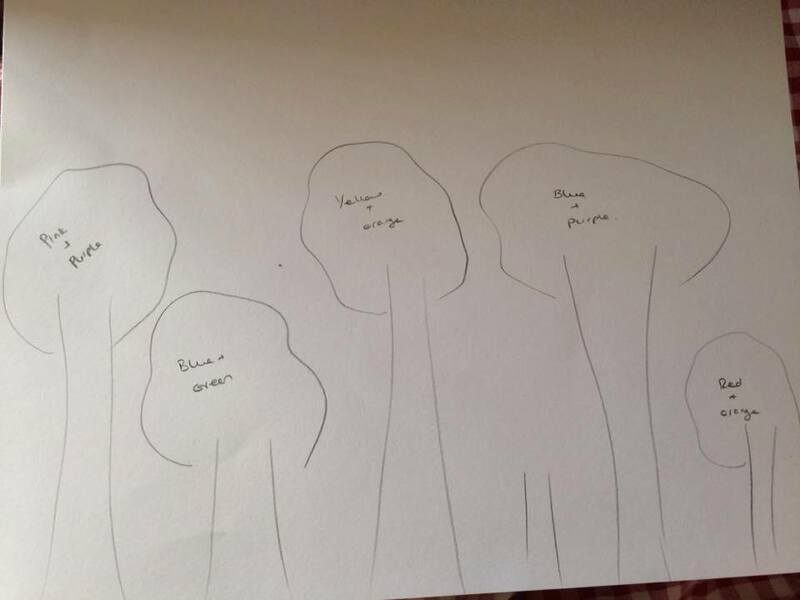 The comments by Lizzie are literally as the colouring took shape. 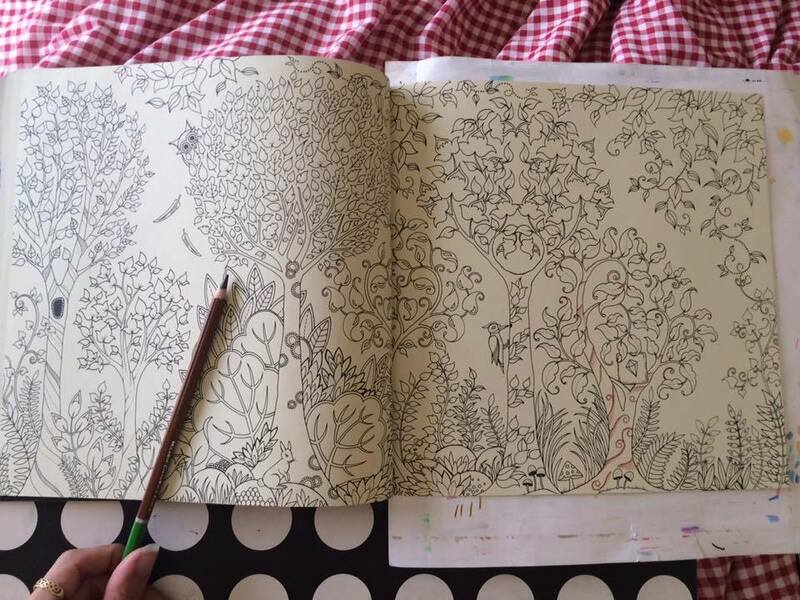 When I began colouring I remember at times feeling a bit overwhelmed by the uncoloured page in front of me. 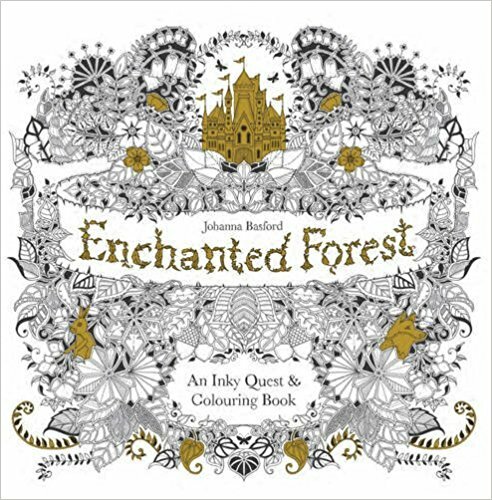 Then I realised that I didn't have to make any decision other than the first element of the drawing I was going to colour. 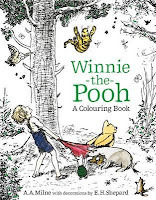 Almost magically, a colouring seems to gather momentum and a life of its own as each detail is coloured. So, it's over to Lizzie. 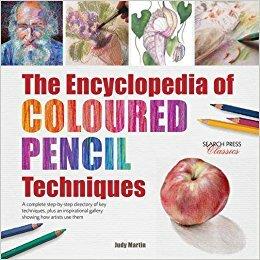 "I'm going to attempt to do this one as a Step-by-Step colouring as I haven't seen one done in ages and I enjoy doing them. 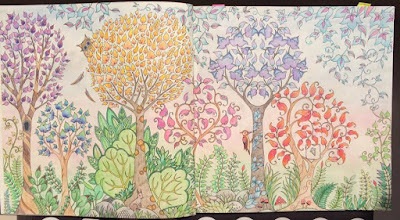 My challenge is this double-page spread from Enchanted Forest. It's the end of day 1 and I've not got a great deal done. 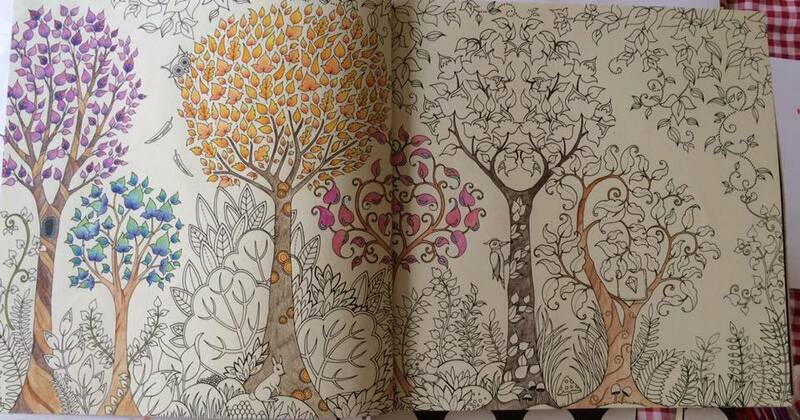 Hopefully tomorrow I can finish the tree trunks and make a start on some leaves. So far I've used my Ergosofts, brown Polychromos, Micador colour rush brown and an FC Classic brown. I have such a mix of pencils! 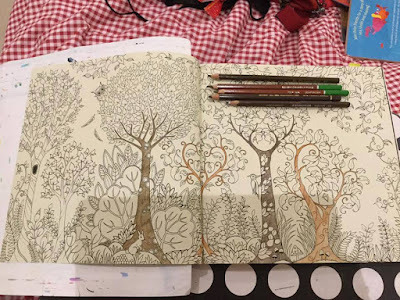 Day 2 of my Step-by-Step colouring and I've finished the tree trunks, done a few of the vines and made a start on the leaves of the first tree. My pinks and purples are paired up, ready. Hopefully I'll get a lot more done tomorrow. 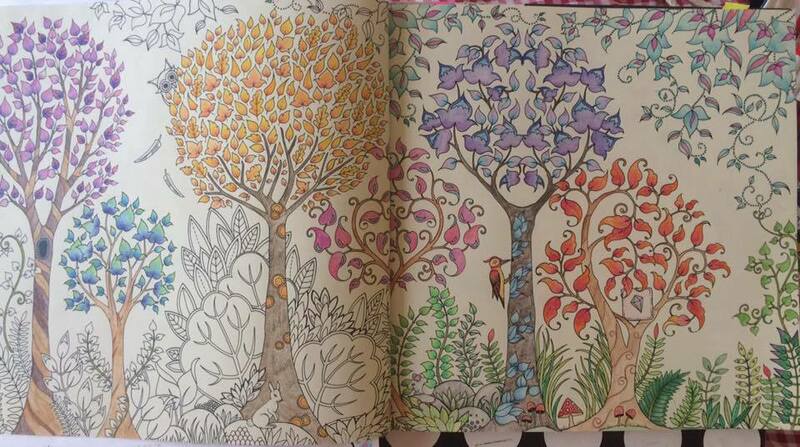 The start of Day 3 as I didn't get to colour yesterday and my next two trees are finished. 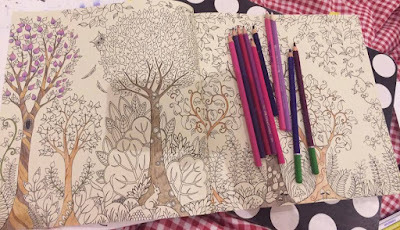 I realised in my plan that I'd missed a tree so I've used one of my favourite colour combinations, teal and hot pink. 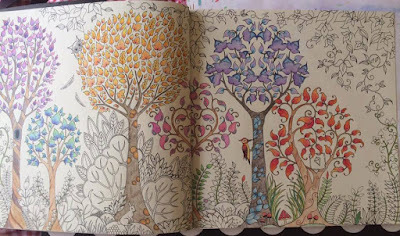 Next is the blue and purple tree. 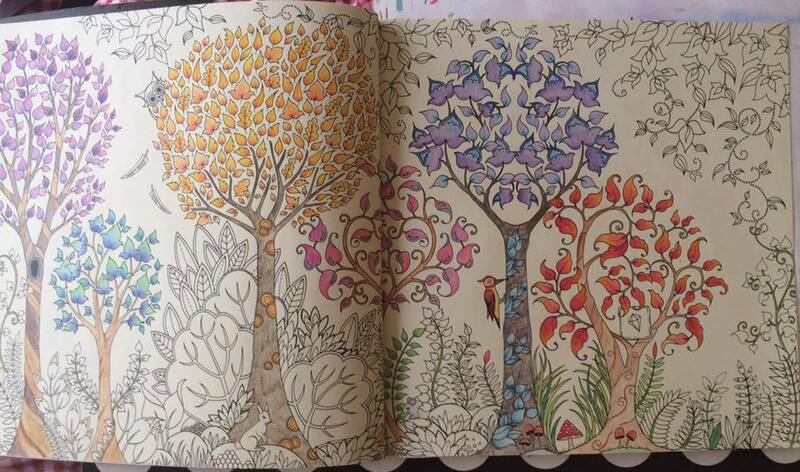 Almost finished the purple and blue tree. 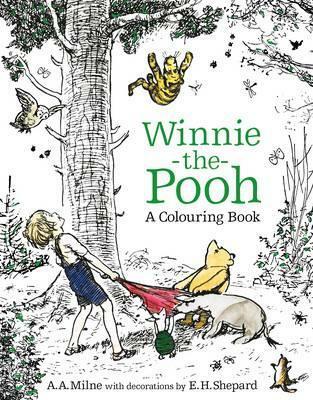 Hoping to crack on with this tomorrow. 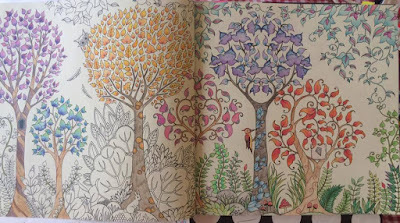 Another day of little colouring but I got all the trees finished and started on the plants at the bottom, along with the woodpecker. 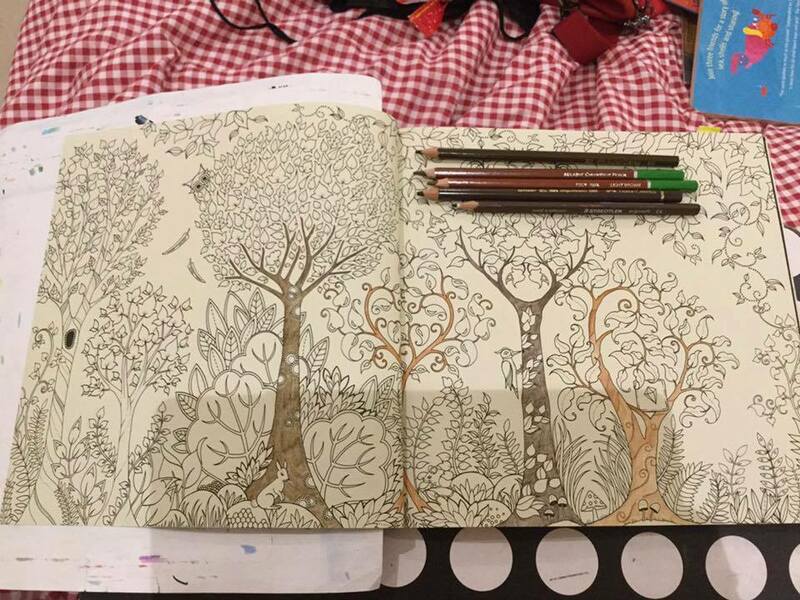 I did the last tree with Polychromos and Ergosoft. I'm starting to work on all the foliage. 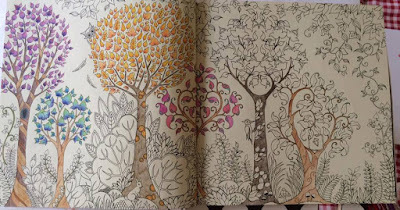 My aim is to do it all mostly green with the odd pop of colour, as there is so much colour on the trees. I finally got some colouring time today. 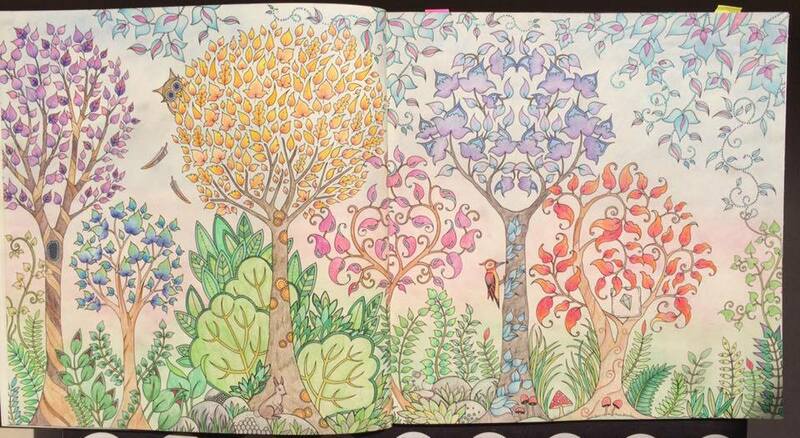 Now working on the leaves at the top, adding in a pop of pink to the green. I have no clue what day I am on now! 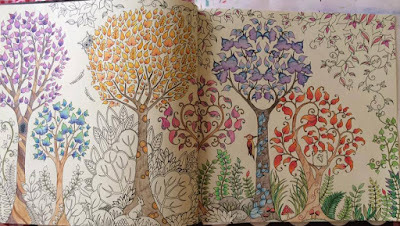 The right page is finished. Now for the left side and then a background. Finished. I think that my plan for this actually worked. 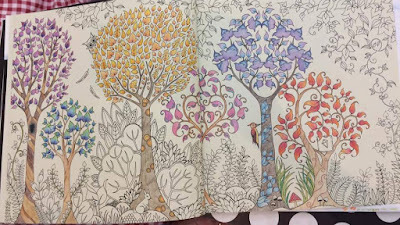 As I did such a mix of colours in the tree leaves, I decided to do everything else mostly green, with little pops of colour. 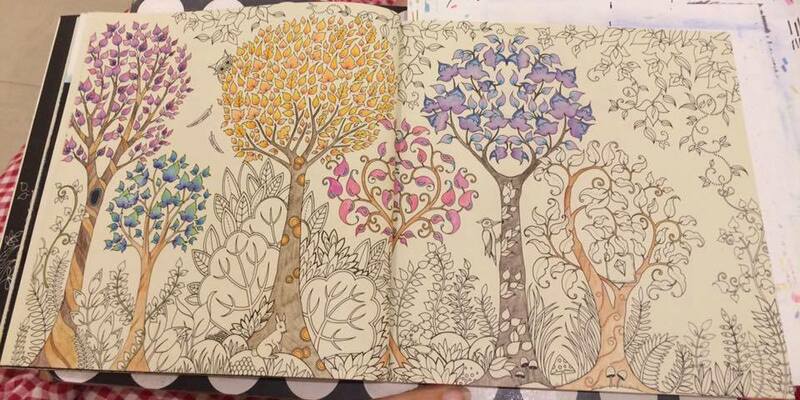 Lizzie sums up - "I felt this one went really well and that my picks for colours worked well together. I'm glad I planned this one out, otherwise I think it might have ended up a mess. As I did so much colour for the leaves in the trees (using the theory that it's an enchanted forest so all colours go) I didn't want to have loads of colours in the foliage." Thanks Lizzie. 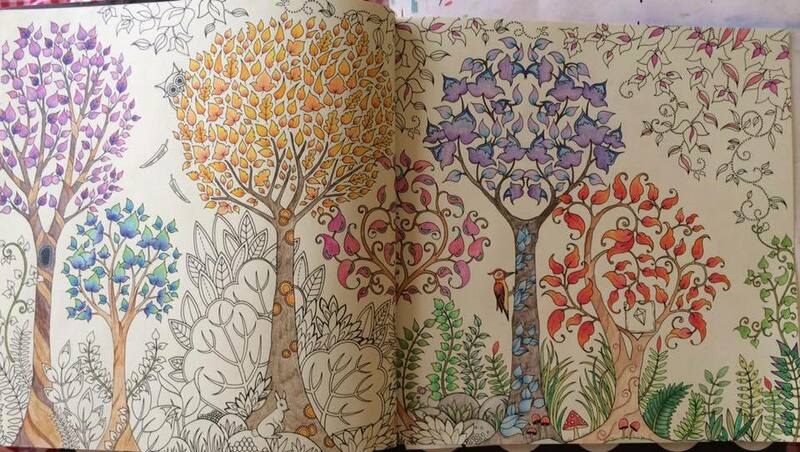 I really enjoyed watching this colouring take shape. Your choice of background colours really makes the tree leaves glow. 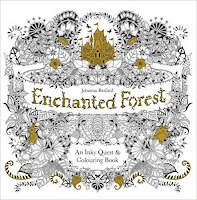 9 Must See New Colouring Books for May - here. The Encyclopedia of Colouring Pencil Techniques - here.